Audi Finally Has A Product Planner In The US That Loves Wagons! Hopefully he can follow through with some cool wagons for the US market. Audi's lineup is looking a bit dated compared to its rivals, BMW and Mercedes. Which is why a product onslaught (with the help of Porsche) is in process that will give Audi the youngest and freshest lineup of the big three German luxury automakers. Speaking with Automotive News, Audi of America's director of product planning, Barry Hoch, talked about a slew of new models that are coming over the next 18 months and the "white space" that he wants to fill in the Audi range. Hoch seems very in-tune with what customers really want. For us, obviously, one request from this side of the ocean is to have an even bigger SUV" said Hoch. This SUV would be larger than the Q7 and compete with the Mercedes GLS and upcoming large SUV from BMW. 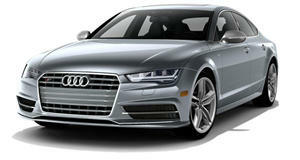 Hoch is already improving the Audi lineup with the refreshed A5 and S5 Sportbacks, which are new to the US. Audi is currently on a roll with 77 consecutive months of record sales since 2010. By the end of next year, we'll have the youngest lineup among our main competitors," Hoch continued. "But we've got to keep the pedal on the floor with the products coming as well. It's the only way we're going to keep our streak alive." Hoch specifically mentioned the Sportback models as a great product for the customers who aren't ready to jump into an SUV. Models like the A4 Allroad currently offer an alternative to typical SUV models. Hoch says that he recognizes the small segment of customers that are "anti-SUV." Clearly Hoch was referring to us with this comment. "There is a small group of aficionados who could benefit from an additional wagon from Audi," Hoch said. "It's certainly something that we see over in Europe, and I want it." As do we, Hoch, as do we.